Area for Over 12 Years!" Building a new home? Renovating an existing one? Enliven your plans with award-winning Bose® sound—seamlessly woven into the architecture of your home. A Lifestyle® BUILT-INvisible® home entertainment system gives you high-quality home theater and more: Music in other rooms. Music outside. And a host of unique Bose technologies that enable quality performance without compromising your décor. Bose and Advanced Home Controls do most of the work for you. You'll get a top-quality system that is easy to operate and ready to enjoy when you are. A typical home installation begins with a "main" entertainment room for home theater and music. Popular locations are the living room, family room or finished basement. "Secondary" music rooms can be anywhere you like in up to 14 different locations, including outdoors. Once you decide where you want your entertainment, simply choose the system that best fits your needs and budget. Next, add your choice of on- or in-wall surround sound speakers. Either way there's no intrusion on your décor. They'll be acoustically tuned to your room by the ADAPTiQ audio calibration system—a proprietary Bose® technology standard in all BUILT-INvisible system packages. The Acoustimass® module will be installed completely out of sight above the ceiling or beneath the floor. Powerful movie effects and robust musical notes are vented into the room through a barely noticeable grate. Yet the sound will seem to come from all around you rather than its hidden source. The amplifier that powers the system is usually installed in a closet—out of sight, yet accessible should it ever need service. Secondary rooms feature in-wall speakers specially constructed to fit behind walls, and engineered to deliver full-range stereo sound for music. All you see are the flush speaker grilles, which can be painted to blend with your décor. We also offer a full selection of outdoor speakers to use on deck or patio, by the pool or in the yard. The end result? 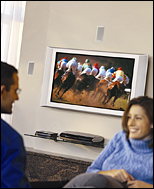 A high quality installed Lifestyle® home entertainment system. Neat. Clean. Breathtaking. From Bose, the most respected name in sound. Why choose a Bose® BUILT-INvisible® system? For homeowners, it's the experience of acclaimed Lifestyle® system performance. And the added elegance and simplicity of in wall speakers or in ceiling speakers integrated into your home, ready to enjoy as soon as you move in. For builders and remodelers, it's the prestige of working with the most respected name in sound. Our proven approach features pre-engineered in wall speakers and in ceiling speakers designed to work seamlessly with your program—and keep you on schedule. For designers and architects, it's the pleasure of discovering invisible speakers that work elegantly within your design plans, not against them. Expect a smooth process that won't interfere with your schedule or creative vision. Bose BUILT-INvisible® systems blend into your client's décor while offering premium performance and ultimate simplicity. Your client's will see only what is absolutely necessary to deliver superb home entertainment... and nothing more. What they wont see see are all of the wires and bulk equipment that normally prevents your client from enjoying their movies and music in their favorite room. It's the coolest Bose has to offer! Creating a BUILT-INvisible solution is as easy as One, Two, Three, Four! Call Today for a Free In Home Evaluation and Estimate! 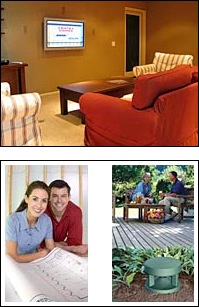 "Advanced Alarm Systems LLC Since 1999"
© 2012 Advanced Home Controls - All rights Reserved.